Salmon is one of the most nutritious and delicious food on the planet and it seems that some people who don't even like fish would admit to liking Salmon. It's available fresh, frozen, smoked or canned. It's loaded with beneficial properties as it has lots of vitamin D,selenium, B vitamins like Niacin, vitamins B6 and B12, magnesium, as well as the prized Omega-3 fats. Well you just read that and might still asked yourself: " Well, so?!!! What's the big deal if I don't eat salmon?! " Well I think that sometimes when we know that things are good for us, we might not eat them because we don't fully realize what exactly they do for us. So I wanted to explain a few of the benefits of some of those vitamins and minerals that are available in salmon so that when you hear about those vitamins/minerals available in salmon or in other food you might ( I hope) be more motivated to add them to your diet. Selenium plays an important role in the prevention of generative disease such as cancer, inflammatory diseases, neurological diseases, cardiovascular diseases, infections and aging. Vitamin D's major role is to maintain normal blood levels of calcium and phosphorus. Vitamin D aids in the absorption of calcium, helping to form and maintain strong bones. Recently, research also suggests vitamin D may provide protection from osteoporosis, hypertension (high blood pressure), cancer, and several autoimmune diseases. Magnesium's benefits are many and include solving or preventing osteoporosis, heart attacks, hypertension, constipation, migraines, leg cramps, kidney stones, gallstones and more. I have heard before that if someone wanted to never be constipated again they should add some magnesium to their diet! ﻿﻿ Nota Bene: Just for the record , I did not eat those chips !!! That was my hubby's tray and I had water with my order! The proof is on a picture below! ha ha! My order that day came with a corn chowder soup! 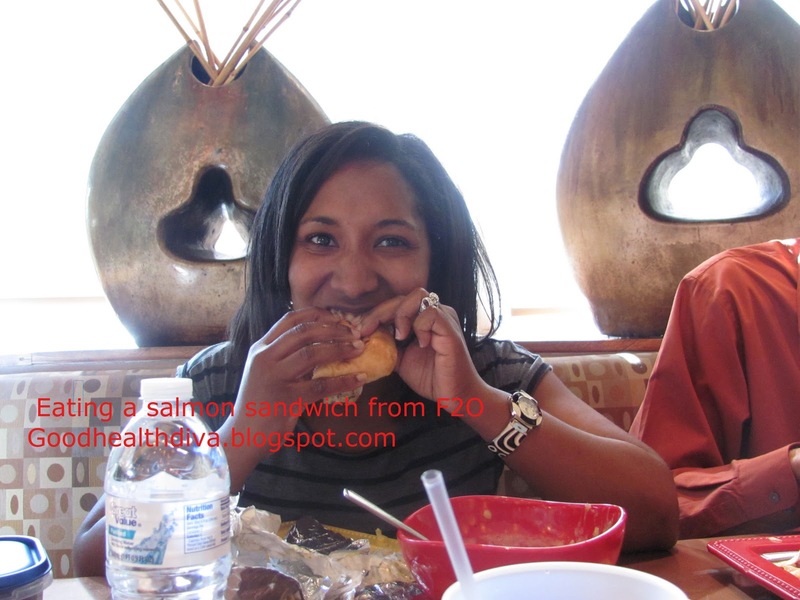 Vitamins B or not you will be greatly happy after eating that sandwich. Went with friends last Sunday, I ordered the same sandwich and a salad this time and the friend who took on my recommandations to try the sandwich was all "Hummm this is gooood Hmmmm.." in a delighted Cuban accent! He was so happy!!!! B Vitamins are mood boosting vitamins and can ease stress, treat anxiety and depression, aid memory, relieve PMS and reduce heart disease risk. Niacin is actually vitamin B3. It greatly helps with the reducing and controlling high cholesterol levels and is also known to benefits our bodies in maintaining a healthy skin condition and good blood circulation. Niacin helps in maintaining good brain function, it boots memory power and it also can aid the digestive tract to absorb sufficient carbohydrates,fats and proteins. Vitamin B6 also known as pyridoxine, helps brain function and helps the body convert protein to energy. It works with Folic acid and vitamin B12. Vitamin B12 is often called the "energy vitamin" of the Bvitamins as some athletes or people with low energy often talk of needing a B12 injection. Apparently clinicians use B12 injections to assist people with low energy level and to support their nervous system. B12 injections is more common among people suffering from pernicious anemia as their body can't absorb it from dairy products or other foods. B12 might also be important in the production of neurotransmitters such as dopamine and serotonin. B12 can even be associated with weight loss due the fact that it increases our energy and metabolism when consumed daily.The vitamin B12 is actually called cyanocobalamin or just cobalamin because it contains the metal ion cobalt. B12 can help keep your mind, heart and nerves healthy! Your body needs this vitamin to make blood cells and maintain a healthy nervous system. B12 also helps with the synthesis of both fatty and amino acids. Well, this is just a little introduction. Vitamins and minerals both work so mysteriously in term of their beautiful role and efficiency in our bodies and salmon is "loaded". I think that in knowing some of the major benefits of those vitamins and minerals it become more clear as to why/how eating some salmon (preferably wild salmon) at least twice a week could be so important to our health. 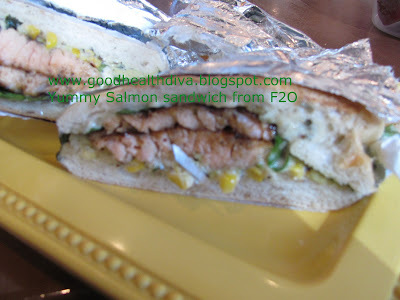 I don't know if it's the B vitamins in the salmon that boost my mood but I am always happy eating that sandwich! The truth is I love good food so just smelling a dish and thinking of the flavors will boost my mood! You might have noticed that I did not mention the benefits of Omega-3! That's because I plan on talking more about them in one of my upcoming post next week!So make sure you come back! In the meantime I am curious to learn a few things from you: Do you take any of those vitamins/minerals above as supplements? Do you suffer from any condition due to the deficiency of those vitamins? Do you have a diet/lifestyle that offer many of those vitamins and minerals? What's your preferred source of Bvitamins, vitamin D and magnesium? I hope i can cook fish better.even i know it is healthy food ,sometimes just don`t like the smell. We love Salmon and are fortunate to get it fresh here in Seattle. It's great! Love your blog! @Mary you are very fortunate indeed. I used to eat good fish constantly when living on the coast growing up. @Nabukay I bought some Vitamin B12 tablets yesterday and started taking them today. I wanted to give it a try! With 3 kids I need all the energy I can get! It's true that swimming can get you really tired. I used to do it once a week and that was enough to knock me out for 2 days! I am impressed that you do it three times a week. I will certainly use you as an inspiration to get me back to the pool. My mom and I love swimming! I am grateful that you all like this post! Since I am trying the B12Vitamins tablets I will keep you guys up to date on it's effects on me!